In January 2003 he came to me because of his elbow problem (RSI), feeling unhappy, discontented and out of balance. He was divorced a few months ago, but they are still living in the same building. The divorce he experiences as "the failure of my life. My life model has fallen apart!" He came to Holland 15 years ago to work as an engineer, met his wife, married and had 2 children (age 11 and 7). He had great ambitions when younger. In his youth he was a lively happy child, he had one brother 3 years older and nice parents "they did their best. I was full of self-confidence, did not accept no for an answer and could be very angry if things didn’t go my way. The feeling of adrenaline was a nice one, I would jump into a fight on a reflex. Apart from that, I was a sweet boy. I always wanted to win at sports. At about 12 a girlfriend made a remark about my vehemence and after that I paid attention to my behavior. I was a good student, I wanted to prove myself to be the best which was my conviction. I wanted to make it to the top, but of what? " He learned to see relativity in life. He sleeps badly these days, wakes at 3 AM feeling totally alone and 'black thoughts' fall over him. His big fear is to fail as a father. "I want to do everything for my children, but I cannot push too much. I want them to be happy and balanced." He likes to take care and spends a lot of time with them. He is aware of his quality as a care-taker and educator. His student time was not the happiest time "I did not want to carve a niche in student life, I was a bit afraid of the harshness and chose for the protected situation of traveling between home and university. I was not in balance during that period. After that I felt the need to travel and take flight and came to Holland. I have a need to have an overview. In my marriage I wanted to be a loving and supportive partner. I wanted to make her happy and have children with her, but in the end it was too much of a restriction for her. She wanted to run her own company with a male business partner which was difficult for me, especially when they seemed to have a kind of relationship. It was terrible and painful. From that time we have lived apart in the same house and that is stressful. I want to talk to understand, but she does not want to discuss it. I think she is beautiful, practical, creative, fast and unable to compromise. I am sensitive to criticism, my self-criticism is strong, I have a need to be respected and to be approved. I wanted to be a "high flyer" (=genius). My energy depends on my sleep. I do not remember dreams well. My memory is getting worse for names and words. I have this frontal tension in my head because I cannot stop thinking. At the beginning of the divorce I could not fall asleep, later I started to wake up too early and immediately the problems about my wife and kids came to my mind. During the interview his word use was quite particular. Being in the situation of studying and comparing bird-remedies, I knew that he might need one, but which? 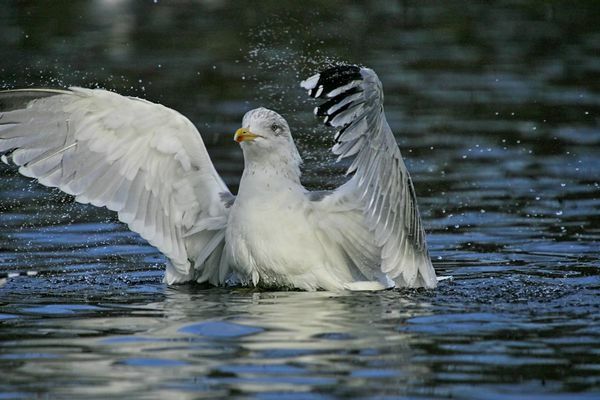 His role pattern as father and partner is similar to that of many birds who, for 90%, spend their lifetime with the same mate and share the responsibilities of raising their offspring. Then his language, like; high-flyer, need to travel and take flight and the need to have an overview etc. I decided that he, although a high flyer, would not need a bird of prey because he was too sweet, not assertive enough, the need for protection and too outspoken. 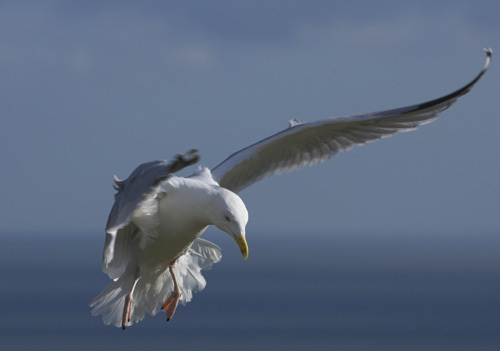 I choose for LARUS ARGENTATUS MK (seagull) from the options I had from the proven remedies because the others did not seem to fit. He feels OK. Sleep is better and he feels more relaxed. "I’m getting more order in my life. I took a new job and I feel glad to be making a new start and this one suits my talents more. I found two mothers with children to share the going out with me and my kids and the care taking, just like a family, because my own family lives in my home country. I do think of a new relationship sometimes. I have good friends with whom I can show my emotional side. I have more fun in life. I want to follow a course in cooking, to go dancing, to the cinema or to sit at home reading, do creative things or sports like squash." "I am going the right direction. If stressed I can set my boundaries much more easily, it feels good. The last couple of days I woke up too early, if the children aren’t at home I do not feel happy. They are away for a few days because it is holiday time. No 'negative' dreams. No more black thoughts. Some worries about my ex, she is not well. I would like to help her, but she still comes back with all her reproaches. He wrote to me to say that he had enjoyed the story very much and that he could recognize himself in it, at a certain level "but I am still learning the slow flight and how to land. Once I master this I will be ready to beam through the sky at great speed...at last!" He did not need another appointment and if necessary he knew where to find me. In this case we did not discuss any physical aspects apart from his actual complaints and they did not seem to have any importance. 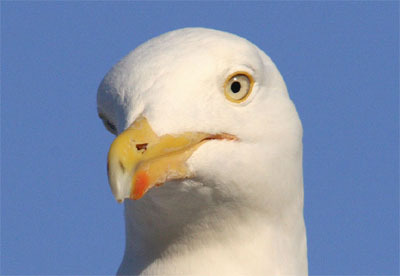 So I cannot confirm the insatiable hunger of the seagull seen in the provings and given as a keynote, but his gradual and sure healing proved to me that this was for him the right remedy at the right time. 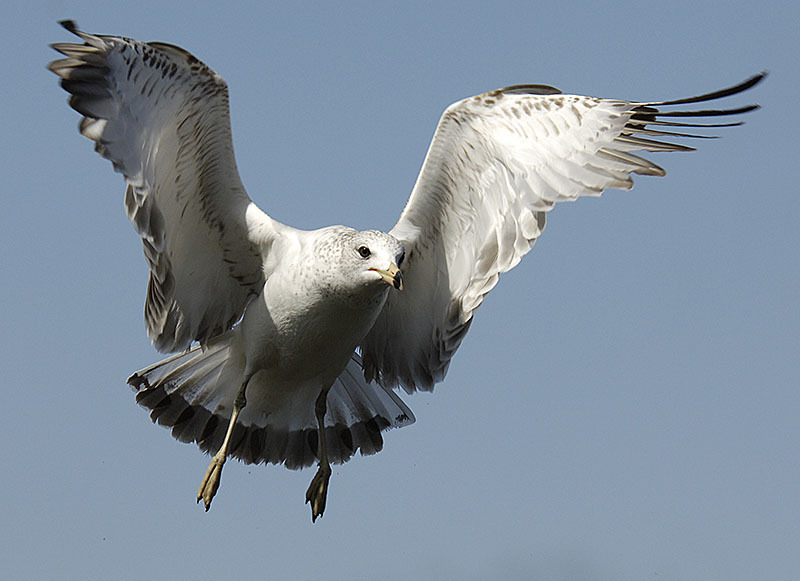 The proving of LARUS ARGENTATUS has been done by Wilfried Finke (Germany), see his publication in LINKS'97.